Often referred to as the "Holy Grail" of energy storage, the economical and efficient conversion of water into hydrogen and oxygen with electricity (electrolysis) has been a goal of scientists for decades. The amount of energy stored per kilogram of hydrogen is roughly two and a half times larger than natural gas and, most importantly, the only byproduct of burning hydrogen for energy is water. In the future, hydrogen could power everything from cars to buildings—but producing hydrogen from water on a global scale could put a strain on purified water sources that are needed for drinking, as well as many other industrial processes. With this reality in mind, a team of chemists at Stanford University have developed a way to convert seawater, which makes up about 97 percent of water on Earth, into hydrogen. Findings are published in PNAS. A typical electrolyzer consists of two metal electrodes—anode and cathode—that are immersed in an electrolyte solution and separated by a membrane. When electricity is passed through the solution, oxygen bubbles off the anode and hydrogen bubbles off the cathode. To minimize the amount of energy required to liberate the hydrogen from water, both electrodes are typically coated with a catalyst. The device developed by the Stanford team has many similarities to commercial electrolyzers—but with critical tweaks that allow it to use seawater instead of purified water. As anyone who has been unfortunate enough to swallow a mouthful of seawater knows, it is salty. Salt, or sodium chloride if you remember high school chemistry, is composed of negatively charged chloride atoms and positively charged sodium atoms. While it is relatively harmless for humans to consume, the chloride in seawater has posed significant challenges for scientists hoping to electrolyze seawater because it causes rapid corrosion of the metal anode. The salt could be removed but would require a costly and energy intensive desalination process. To avoid a desalination step, the team at Stanford set out to develop electrodes capable of withstanding the harsh conditions required to electrolyze seawater. The anode in this study consisted of a porous nickel foam current collector coated with a highly active and inexpensive catalyst made out of nickel and iron. The catalyst itself is not prone to corrosion but the underlying metallic conductor is more reactive and easily becomes corroded when in contact with a chloride solution. To solve the corrosion problem, the Stanford team found a way to inhibit the migration of chloride ions through the catalyst layer and prevent them from reaching the metal. The trick turned out to be including a high density of negatively charged sulfate and carbonate molecules within the catalyst layer and at the catalyst-metal interface. Because molecules of the same charge repel one another, the sulfate and carbonate ions block the transportation of chloride ions and allow the electrode to operate without corrosion. The stabilized anode was able to electrolyze seawater for up to 1,000 hours and at the same current density used in industrial electrolyzers. The researchers even increased the salt concentration to three times what it is in real seawater and the electrolyzer was still stable for 1,000 hours. For the electrolysis of water to be a clean hydrogen production method, the electricity must come from a renewable source. By teaming up with a solar cell research group from the engineering school, the chemistry team was able to demonstrate an efficient solar-powered seawater electrolyzer. The solar cell used in this work is known as a "Perovskite" and has been the topic of intense study over the last five years because it is potentially inexpensive and capable of achieving impressive energy conversion efficiencies. A previous study by a Swiss team utilized a Perovskite solar cell to efficiently drive the electrolysis of water—and the Stanford group was able to achieve a similarly high efficiency with seawater. However, Perovskite solar cells are still in their development stage and so the actual device used was less than one centimeter squared. 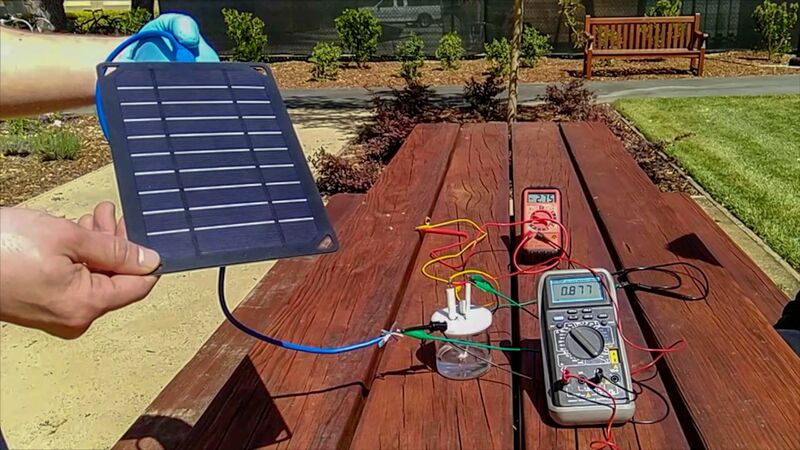 To generate industrially relevant current densities with light energy, the team used a commercial silicon solar cell to drive almost 1 A/cm2 of electricity through the electrolyzer under real sunlight on the Stanford campus. The breakthrough opens up the possibility of seaside plants, where clean hydrogen can be produced using sunlight and seawater. Hongjie Dai is the J.G. Jackson & C.J. Wood professor of chemistry at Stanford University and Mike Kenney is a PhD Graduate Student at Stanford University. This story has been updated to include Mike Kenney as an author.